According to CBC, AC/DC guitarist Angus Young has donated $19,260 CAD (approximately $14,580 USD) to the Alzheimer Society of Ontario after hearing about a Canadian fan's unusual fundraiser. Steve McNeil, who lost his mother and his mother-in-law to Alzheimer's, has been travelling across Canada to skate for 19 hours and 26 minutes in each of the country's NHL cities, raising awareness and money for local Alzheimer's societies. His effort is a tribute to his mother, and to Angus's brother Malcolm Young, who co-founded AC/DC and died from dementia at age 64. AC/DC's accountant, Vicky Granados of the accounting firm Prager Metis, told CBC that Angus and his wife, Ella, "stumbled across" an article about McNeil's 19-hour skates and asked her to write CBC for more details about supporting his fundraiser. 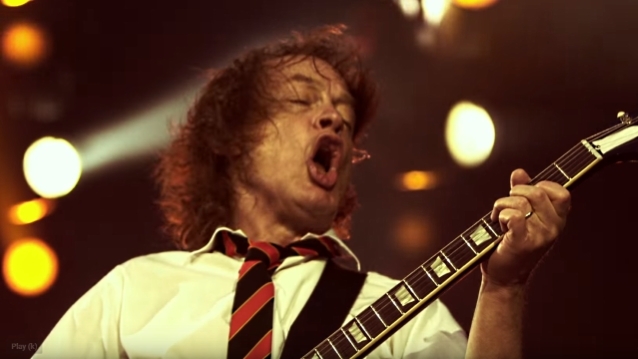 In December 2014, Malcolm revealed he had dementia which forced him to retire from AC/DC. His nephew Stevie Young stepped into Malcolm's position. Angus later said that he realized during the recording of the band's 2008 album "Black Ice" that his brother's faculties were impaired. "The physical side of him, he got great treatment for all that so he's good with all that, but the mental side has deteriorated," Angus said. "He himself has said, 'I won't be able to do it any more.'" Malcolm died in November 2017 after failing health for several years. Hundreds of mourners gathered for his funeral in Sydney, Australia, including Angus and other members of the Young family, along with AC/DC drummer Phil Rudd, bassist Cliff Williams and singer Brian Johnson. AC/DC is rumored to be making a new album which will be dedicated to Malcolm.